This is the true, however short story of an orphaned child who only managed to survive his first six years of life thanks to the charity and good-will of villagers in the small village where he lived. The child’s name was Gung-Ho. He travelled far, and with his feet scuffed and bleeding from the journey and the cliffs he had scaled, he finally climbed the steep steps to the foreboding wooden gates of the Peril-Takisong temple, a Monastery that trained boys into Monks. Here he hoped to be one of the very few boys chosen to become a Monk. For three days he sat outside the Temple, the ground was cold and hard, but he sat and sat. He ate the last morsel of his food, a stale biscuit. He knew he had no food left should he need to return to the village. His strength had abandoned him, and the cold began to engulf him, and take him into a never-ending slumber, he heard the sound of steel sliding on wood. It was the bolt that secured the wooden gates. The gates opened, pushing aside a pile of fresh snow, and young Gung-Ho was carried unconscious into the Monastery. When Gung-Ho awoke several days later, he had been nursed back to health and taken under the wing of a kindly old Monk. Soon he began instruction in the art of Penzai; or as it is commonly known, Bonsai. Bonsai is regarded highly as it trains boys to be patient, and caring, and nurturing, and as a Monk, these are pivotal areas of study and reflection. “When you have mastered the art of sculpting the tree you will be ready to leave the Temple.” Is a rough translation of the old Monk’s words. Gung-Ho was a diligent. As diligent as a student can be. Sometimes he would be forced to wait months before he could trim a single leaf, but using Zen, Gung-Ho was able to sit for hours and visualize the shape the tree would take. By the time Gung-Ho was twelve years old, his skills were unmistakable… he had none. No matter how much knowledge the kindly Monk bestowed, the boy seemed completely oblivious. Not a clue did he have, not an iota of skill or ability. The old Monk persisted, as Monks are very patient. Gung-Ho was schooled for hours in aesthetics, shape and form. His mentor was tireless, teaching him everything he knew about composition, presentation, display and other artistic elements of design. But it was useless. Hopeless. He didn’t simply lack sensibility; he was a butcher. At eighteen years of age, he was expelled from the Monastery and sent back into that cruel world he had been saved from all those years before. Gung-Ho would now have to fend for himself. Many years have passed since Gung-Ho left the Monastery, and you will be pleased to know the story has a happy ending. Gung-Ho finally found his place in life. He now lives a happy, contented existence. And he has the perfect job. 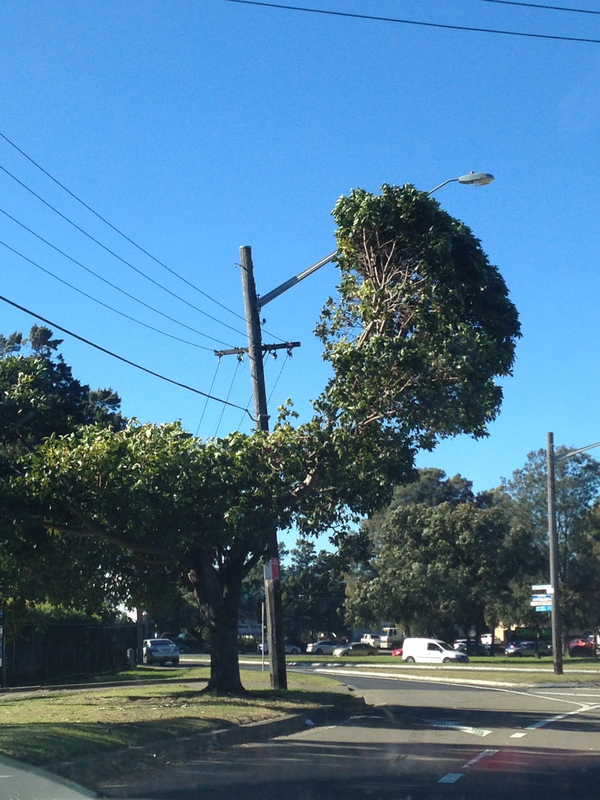 Gung-Ho is an arborist (tree lopper) for the Sutherland Shire council. The trees around here are almost funny in the way that they’ve been disfigured. I originally wrote this for the local paper but they didn’t run it. I’ve become a crank, writing letters to the paper. Hahaha! Descendants of Gung-Ho must have immigrated to the US! Thanks for explaining the seemingly unexplainable. I wrote it for the local paper, but they didn’t get back to me. I’ve become a crank.